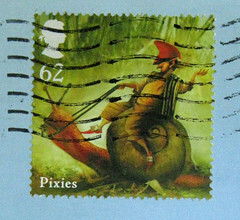 Ah, postcrossing. Sometimes you get crap, and sometimes you get an absolute gem. 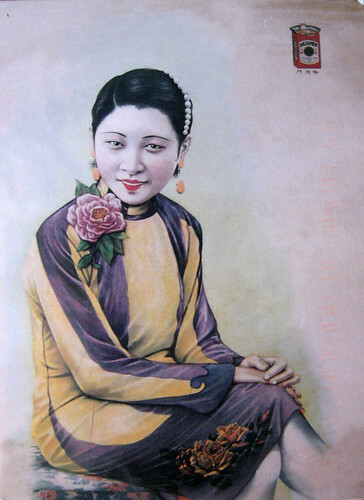 I am totally enamored with this postcard from Maggie in Shanghai, who translated the characters on the back and told me on the card that "This card is a beauty of Shanghai 1930." Now, go ahead and view large and tell me if you don't agree with me that the little object in the upper right-hand corner is a pack of cigarettes. My bet is that this was an old cigarette ad. I am a smoking bigot, I absolutely loathe cigarettes and smoking, but I'm going to post this postcard anyway because I love the Shanghai beauty. really nice card and thanks for sharing with us . Yes I loathe smoking as well . yes it does look like that a smoking ad I mean . really nice card quite the gem indeed . Have a great day . Hi Ilona. Very nice postcard. Is this one you bought or one someone sent to you? I enlarged the picture and the symbol on the upper right hand corner does look like a pack of cigarrets to me. In the 1930s and 40s etc they did make cigarrett adds glamorous. I have a postcard I bought a few years ago when I was visiting my sister in California. It cost a dollar but it has a glamorous picture of a a woman with bright red hair in a one piece bathing suit laying down. I saved it in my scrap book as a souvenir from the trip. Can you believe a postcard costing a dollar? I do like those postcards with vintage glamorous images on them. Anyway, just wanted to put my two cents worth in and then some. Tascha - I may have been unclear in my original posting text: it was sent to me from a Postcrossing user in Shanghai. Ilona, Yes I have seen Retro Chinese cigarette ads similar to the one you posted here. I guess you could call me a smoking bigot, too. I have loathed cigarette smoke for a long, long time. It is such a stupid habit; you not only pollute yourself, but those around you as well! But, coming down off that soapbox, yes I agree the image is nice. Wow, Chris, thank you for all that wonderful information!